Owning a vehicle is expensive. The car payments, insurance, and maintenance cost can accumulate to over thousands of dollars annually. Fortunately, we live in a time where a vast amount of information is just a click away through the internet. With the help of the internet (and car enthuse people that love to educate others about cars, the internet is full of articles and videos that you can watch and for simple DIY repairs for your Nissan at a fraction of the price auto shops are charging. Here are 8 DIY repairs that are simple and will save you lots of money. Remember to use the internet as a resource - Google articles and watch YouTube videos that are specific to your vehicle. Read a few articles and watch a few videos created by people that you understand. Yes, that’s right. Changing your brake pads is easier than you think. I went to my cousin’s house the other day - who is a nurse and not a mechanic - as he was in his garage with a 2007 Toyota Sequoia lifted about 3 feet, changing the brakes. I asked him if it was hard because of the size of the car. He explained that it is easier to change the brakes in a bigger car. So for approximately an hour I listened and watched while he explained each step. It turns out it is easy! So next time you want to take your car in for new brakes and pay hundreds of dollars for someone else to do it, allocate an hour or so to doing it yourself. Depending on the type of car you own, brakes can cost anywhere from $20-$40. Moreover, the auto shops will charge anywhere from $150 and higher. A battery change is another super easy super fast DIY car repair you can do at home. A typical battery lasts about 4-6 years and surpassing the life of a battery can cause you to be stranded and stuck. Be sure to keep track of your battery age and check it when it gets closer to the end of its life. A battery itself will cost somewhere between $75-$150, again depending on your car. Be sure to remove the NEGATIVE (black) cable FIRST, and when you have installed the new battery, replace the NEGATIVE cable LAST. If you don't do it this way, you could short-circuit the positive (red) terminal to a grounded part of the car. Air filters are necessary because it filters the air circulating into a vehicle to keep it clean. A dirty one can allow polluted air to enter. It can also make your car work harder to circulate air causing your gas to consume faster. If you go to an auto shop to change your filter, they mark up the air filter price by a lot. A famous oil change shop I use to go to wanted to charge $25 for the filter for my car. I went online I saw it for $13. Walmart upcharges to $20 and it does not include the price of replacing it. Except for German cars, all you have to do is remove the screws of the casing and pop the casing off then change the filter. The headlights and taillights of your car are essential for a clear vision of your surrounding as driving - for you and other drivers around you. It will be hard to see and be seen without lights that do not work. You can get a ticket for driving with a broken light. Replacing the headlight or tail light bulb is one of the cheapest maintenance DIY projects. I purchased a set of two bulbs for less than $10 on Amazon. The one thing you want to be careful of is popping the actual light casing. On some cars it is connected by wires, so be sure you don't break any wires by popping it off too abruptly. Replacing the windshield wipers is a simple DIY car repair and the one that gets typically missed. Since southern California experiences about 30 raining days a year, the windshield wipers may not be on your radar. However, no matter how dry our sunny California can be, we do find ourselves experiencing harsh storms. I am looking at you winter storms of ‘17 & ‘18. So, don't get stuck in a storm in 2019 without working windshield wipers. All stores carrying windshield wipers will have a manual that will tell you which one to purchase for your car. Google can also point you in the right direction. In most cases, the old wipers slide out, and the new ones slide in. It seriously is that easy. Having chipped windshield is annoying. Most of the time it is caused by outside environmental factors, such as construction or random rocks just flying about, and not of your own doing. However annoying it is, fixing it is necessary to avoid further damage. Go to Amazon or eBay, and find windshield repair kits for under $15. Some run as low as $8. When you get it, all you need to do is dig out any loose glass with the pin provided, and then thoroughly clean it, and the surrounding area. You will have to stick a small device to the windshield that forms a seal around the rock chip, and then a vacuum contraption will work to apply the resin into the crack. It's an operation that takes less than one hour, from opening the package to the finished result, and most of that is merely waiting time. Stop that crack from spreading, before you need to replace the entire windshield. That can be costly. Oil changes are enviable. Your car requires oil so that the engine can run properly. Without clean oil, your engine will malfunction, leaving you with hundreds of dollars in damages. Because oil changes are common car maintenance necessities, YouTube houses a lot of "how to" tutorials. Look around and find one that is specific to your car. Professional oil changes usually cost anywhere from $40-$100. Be sure never to change your car’s oil when it’s hot. 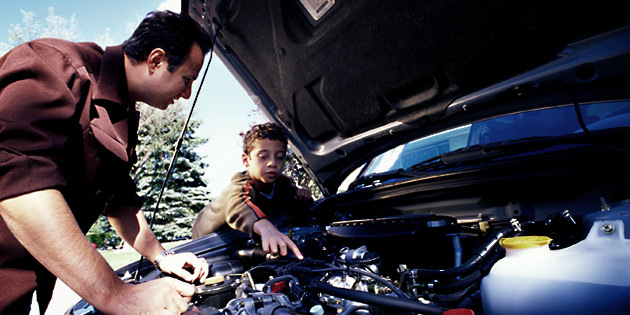 To be safe, wait at least two hours after operating your vehicle to do this DIY car repair. Consult your car’s manual to figure out the best oil type. When your car is armed with good spark plugs, you will have better fuel consumption ratings and overall better driving experience. The great thing about spark plugs is that they last a long time and when you do have to replace them they’re super cheap. When the time does come to replace your spark plugs, along with your regular set of tools you will need a spark plug wrench. Again, this is a "buy once, use for a lifetime" kind of purchase, and it's not very expensive (under $10 in most cases). The cost difference when you do it yourself compared to paying a mechanic to do it is significant. You can spend over $300 to change the spark plugs, and spark plugs themselves are rarely more than $30 for a set. The internet is full of resources that will help you with DIY projects. Once you find articles and videos, from a person that you easily understand and specific to your vehicle, you will save money and feel like a pro doing it.